This versatile 25.0 cu. ft. built-in refrigerator by KitchenAid features the ExtendFresh Plus Temperature Management System, which maintains the perfect temperature for fresh ingredients. The FreshFlow Produce Preserver extends freshness by neutralizing the over-ripening effects of the ethylene emitted by certain fruits and vegetables. It also features PrintShield, a fingerprint resistant finish, which protects against smudges and enhances the look of the refrigerator. Excellent product - works as expected This refrigerator was expensive (for us), but we needed to replace the built-in Subzero unit that died. We did not enjoy the installation process and first unit delivered was damaged. The sales associate at Best Buy was very patient, understanding, and worked with us to finally resolve all our installation issues. The product is, however, exactly what we expected and paid for. great refrigerator replaced my old kitchen aid. the only complaint I have is the holders on the door. It hard to get things in and out of them and you really can't adjust them. Otherwise has beena great frig so far. Great Replacement of and older model This refrigerator is a wonderful replacement of an older Kitchenaid model. This has so many bells and whistles that makes the cost seem not so bad afterall. I have only had this new Kitchenaid Refrigerator about 3 weeks. The cost of a new built in is a bit of a shock until you see this one and all its goodies. Now it does not seem so expensive, it is well worth the investment in my kitchen. Swallow hard and buy it, you will not regret it. Great product. Great Built-In Refrigerator I needed a new 42" built-in refrigerator to replace a 15-yr old unit that's no longer working. So far, I can definitely see that the new frig is noticeably quieter than the old one. The bright interior LED lights light up all corners of the interior, again a huge improvement over the old unit. Water and ice dispensers also work flawlessly. Great frig. 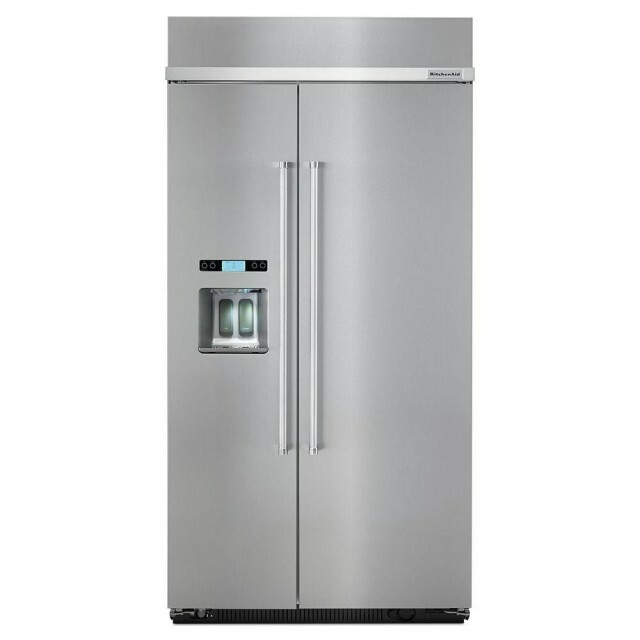 Oversized Fridge with limited space This product is the for the 42" fridge made by Kitchen Aid. To begin, the esthetics of this product are actually really nice. Very visually pleasing product. However, the material it utilizes are not what you would expect. The front of the fridge is not made out of stainless still as advertised as none of my magnet are actually able to stick to it. Installation by the Best Buy team was actually pretty simple but it does require 3 people. 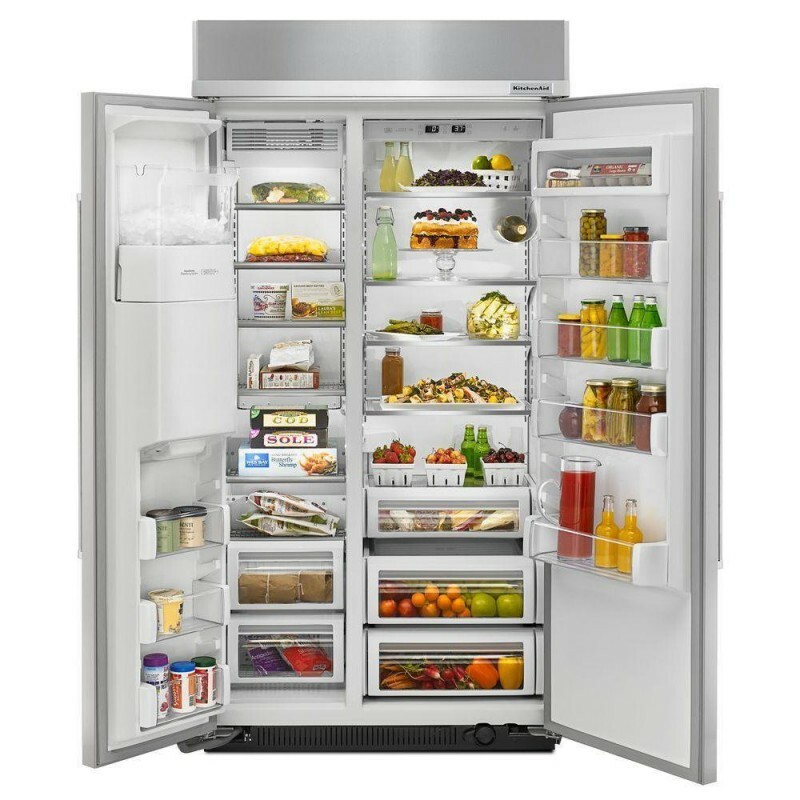 Now for function, the fridge is definitely higher than other fridges. 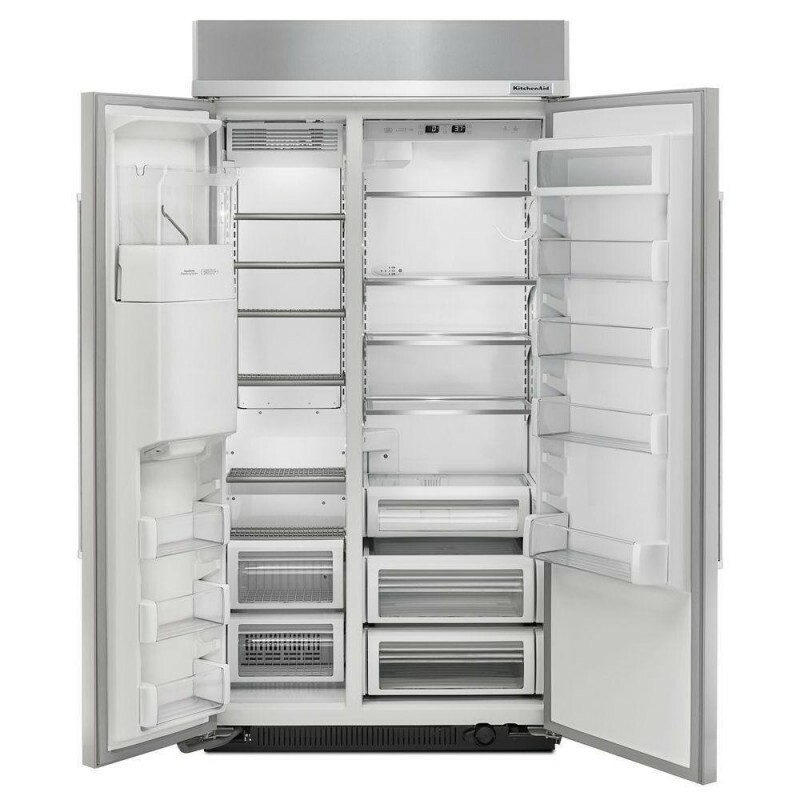 However, the amount of space you would expect from this fridge is actually limited compared to what you are used to with other deep fridges. This is counter depth, not to forget. The amount shelves are actually not designed to be efficient as we have to now keep one of the shelves off because otherwise, any of your tall bottles of juice or soda may not fit. The side doors are also pretty cramped. We have some bottles of sauces that actually do not fit in the side so that have to be placed on therein shelves and that takes some spaces. Pizza boxes and what not are not going to fit as well so dont expect the space the you would from a french door. The freezer in itself is also pretty small and limited in space. So far, for the mechanics, our product works well. 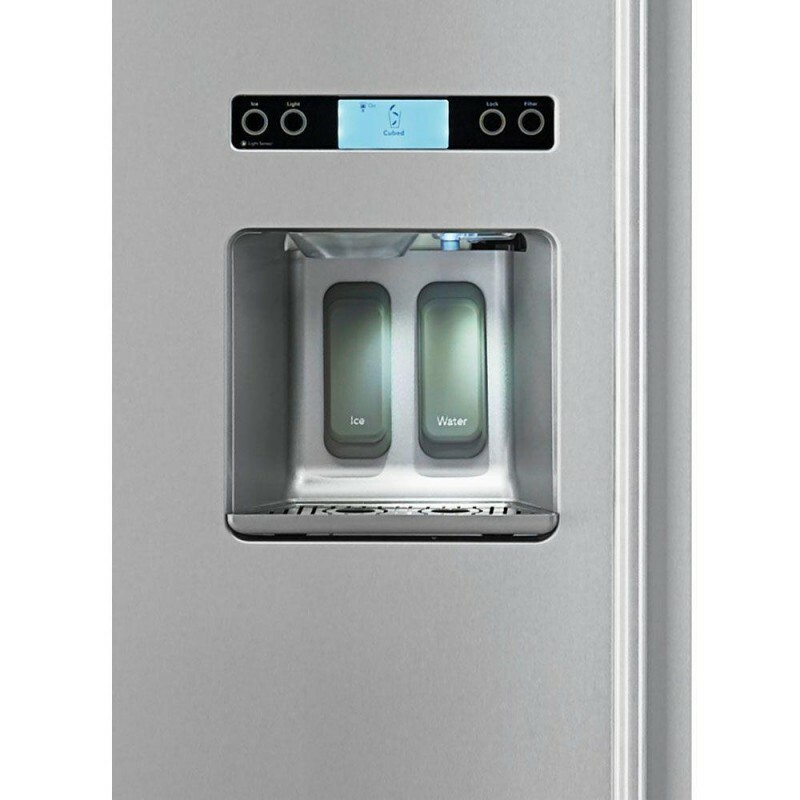 The water dispenser and ice maker are actually pretty pleasant to work with. The ice bucket filled up after barely a day and the water is pretty crisp tasting. Overall, its an ok product that does what it is advertised but like i said, it definitely will need a little better design for space and functionality especially for the price it cost for the extra 6" only that is added. Otherwise it is usable.